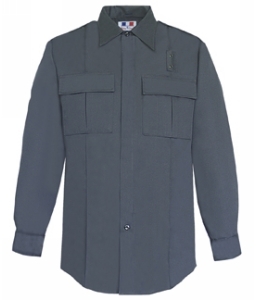 Flying Cross Poly/Cotton Long Sleeve Tactical Shirt | 201352, FLYING CROSS, Flying Cross Poly/Cotton Long Sleeve Tactical Shirt | McDonald Uniforms, Inc. THIS SHIRT IS MADE OF THE SAME FABRIC AS OUR TROUSERS FOR THE BEST POSSIBLE MATCH AVAILABLE. IT'S A PRE-CURED FABRIC SO IT HAS A COMFORTABLE "SOFT HAND". VALUE ADDED FEATURE: INTELLIDRY- COLORSMART DEEP DYE TECHNOLOGY, NATURAL STRETCH, WRINKLE RESISTANCE, TRIPLE ACTION STAINSMART 3.